Whether a hotel is providing space for a business seminar, a large conference or a celebration, those reserving the space are likely to want a podium. Lecterns help a presentation look professional and enhance the confidence of many speakers by providing a place to hold presentation notes. ProProducts’ portable lecterns offer features that make them an excellent choice for hotels and their customers. 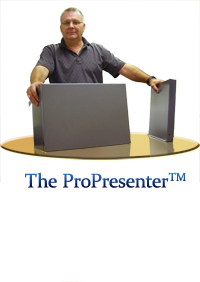 The ProLectern is a convenient, collapsible, lightweight podium that a hotel employee can quickly erect. No tools are required to erect the ProLectern, so any staff member can erect the podium without an on-site maintenance man. There are many other reasons why ProProducts’ portable lecterns are attractive to hotels. Since hotels often host multiple business conferences, meetings, and parties at the same time, they may need several lecterns. 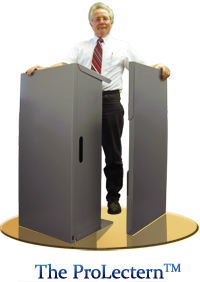 They want lecterns that are cost-efficient, durable and easy to store. 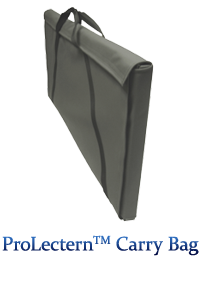 Our budget-friendly lecterns can be stacked in a closet, hung on a wall or stored virtually anywhere. They are 22 pounds and can be easily carried to any room by using the convenient hand holders or a nylon carrying case. Additionally, using our foldable podiums give hotels the flexibility to configure rooms to accommodate any size group to maximize profitability. In contrast, heavy podiums that are difficult to move may require hotels to arrange the room around the podium or book rooms less cost-efficiently. The aluminum will not become damaged from the sun or rain, so our podiums are also ideal for outdoor speaking engagements, such as weddings, engagements and religious celebrations. Our podiums are ideal for making toasts, honoring guests and officiating religious ceremonies in any weather. Since a portable lectern will be moved to different rooms, hotels will also appreciate that ProProducts’ stands behind its products with a six month warranty. Our podiums do not chip, fade or crack. They will appear professional and clean for years. Additionally, ProProducts’ lecterns are delivered directly, so hotels never have the inconvenience of communicating with a middle man. Customers will appreciate the two media portals which allow speakers to hook up microphones or other equipment while keeping dangerous cords out of view. Our portable lectern and our table top podium include a ProjectorBoost shelf, which provides additional space for a projector. Both models are made out of sturdy aluminum that is resistant to spills, and the podiums include a cup holder. The lecterns provide ample space for notes. In addition, the ProPresenter floor lectern contains a cabinet, so speakers can store giveaways,briefcases and other items until they need them. Business presentations are likely to progress smoothly when distractions are minimal, and the speaker has all his or her notes, technology and visuals organized. ProProducts’ portable podiums make it easy to offer guests seeking hotel space for business and celebratory purposes a functional, quality lectern that enhances their presentation. When customers use hotel facilities for speaking engagements, they will remember the convenience of using a ProProduct portable lectern and may book additional meetings because your hotel successfully catered to their presentation needs. Talk to our representatives today to learn more about ProProducts’ lecterns and how they can help your guests’ speaking engagements appear effortless.